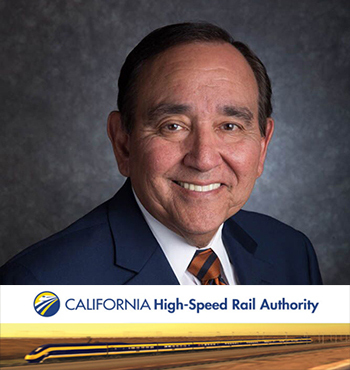 SACRAMENTO, Calif. – Today, the California High-Speed Rail Authority (Authority) Board of Directors Chair Dan Richard issued the following statements regarding the appointments of Ernest M. Camacho to the Authority’s Board of Directors and the Honorable Jim Beall to an Ex Officio Board position. “We thank the California Senate for the appointment of Mr. Camacho to the Authority Board of Directors. Mr. Camacho has had a distinguished career in project and construction management, and his wealth of knowledge and experience will be a valuable asset to the Board as we continue to move forward with construction,” said Richard. “We also thank the California Senate for the appointment of Senator Jim Beall to the Authority Board of Directors as an Ex Officio member. Senator Beall has long been a champion of high-speed rail as well as other transportation and connectivity projects throughout the state. We welcome his valuable input, active involvement, and oversight of the program,” said Richard. Mr. Camacho is the founder and current President and CEO of Pacifica Services, Inc., a Pasadena-based firm specializing in program, project and construction management services as well as civil and electronic engineering. He also has been active in the Southern California community through his volunteer work. He is a current Board Member of the Los Angeles Latino Chamber of Commerce. He also served as a Foundation Board Member of the White Memorial Hospital, Chairman of the Board for Hollywood Presbyterian Hospital, Board of Trustees for the Claremont Graduate University, the Board of Regents for the Loyola Marymount University, Chairman of the Board of the Center for Community and Family Services and was the Chairman of the Board for the Rail Construction Corporation which was responsible for the design and construction of the Blue, Red and Green line in Los Angeles County. His compensation is $100 per diem not to exceed $500 in one calendar month, plus actual travel expenses incurred in attending to the business of the Authority. His appointment fills the vacant spot previously filled by Lou Correa, a former member of the California State Senate, who was appointed to the Authority Board of Directors in March 2015. He stepped down in November 2016 with his election to the U.S. House of Representatives. In 2016, Governor Brown signed Assembly Bill 1813, which added two non-voting ex officio members to the Board. One member is to be a Member of the Senate, appointed by the Senate Rules Committee, and the other is to be a Member of the Assembly, appointed by the Speaker of the Assembly. Senator Beall fills the Senate Committee on Rules’ position on the Board, while the Assembly position has yet to be filled.